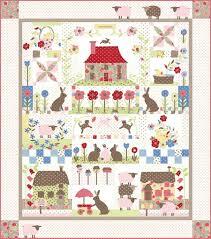 If you love applique and precious English countryside then this Block of the Month is for you. Join Anita as she teaches you all her tips and tricks for Starch and Press Applique. You will learn how to work with tiny pieces and add little touches to your work with embroidery. This is a nine month class. As with all Nanas Block of the Month classes there will be food and fun along the way. There is limited space in this class so sign up soon. All supplies for this class will be available in house. We encourage you to buy as many of your supplies here at Nanas to keep future class costs down.